As we've mentioned previously, if you live in an urban area and are a carfree family (or even with just 1 family car), you will spend way more time obsessing about car seats than your friends with cars do. Add to that the stress of picking anything safety related for a baby you haven't met yet, throw in some pregnancy hormones, and what you have there is a steaming cup of panic brew. So while you practice your deep breathing, here are some thoughts about how to choose. 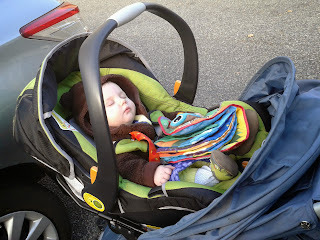 Do I need an infant car seat? If you, or anyone else, will ever transport your baby in a car I really recommend going with an infant car seat rather than a convertible one. (Confused about the difference? Look here). It's not often that we recommend buying more baby products when less will do and especially when it comes to car accessories. The reason we recommend going with an infant seat is that they are much, much easier to install rear-facing than convertible ones. In fact, I recommend strategizing such that you never have to own or install a convertible car seat at all, but very especially, rear-facing. Yes this means you will likely have to own at least 2 different car seats over the course of your child's life, possibly even 3 in some circumstances. But I promise it will be so very worth it in massive amounts of frustration saved. There are 3 things you need to consider when picking a carseat (infant or otherwise). 1. Ease of installing it (correctly! ), with and without a base. This one is really important for obvious reasons. But in particular when you try this out at a store (many stores have a sedan seat for you to practice installation), make sure you pay attention to the baseless install. Frankly, I can count on one hand how many times I've installed the base with either of my kids. Get a seat you can easily plop in with just a seat belt, and that's 5 lbs of bulky weight you can say good bye to transporting. 2. Ease of transporting it. A seat can be easy to transport because it is light, because it snaps into your stroller, or because it has its own wheels. If none of these things is true, you're going to be very sorry about buying it. 3. How quickly your child will outgrow it. Ok this fact is discussed very poorly on the parent internet in my opinion. For some reason the number always thrown out for the "max" measurement of a child with infant seats is the maximum weight a child can be to use a seat. The number that's really hard to find, unless you really go looking, is the maximum height a child can be to use a seat. This is really weird and insane. For example, many infant seats top out at 30 lbs and 30 inches of height. A 30 inch boy is in the 50% percentile at 12 months, a 30 lb boy is in the 50th percentile at two and a half years. What this tells us is that the overwhelming majority of children will outgrow the seat in height way before (a year and a half before) they outgrow it in weight. So why do you keep advertising the weight? I don't get it. Anyway, since you're required to keep your child rear-facing by law until 1 and by recommendation as long as possible or until 2, you want to pick an infant seat with the tallest possible height. I really recommend trying to find a seat that's rated for at least 32 inches of height. (If you want to play around with percentiles look here). That will almost guarantee you use of your seat until 1 year of age, but likely 18 months or more. At that point you can go straight to the folding IMMI GO. Why didn't I put safety on the list? All infant cars eats go through a ton of testing and are pretty equivalently safe when installed correctly. The best thing you can do for your baby is to pick an infant carseat that you can install correctly until they are as big as possible. Yes the Doona is kind of ridiculously expensive (you can often find it a couple hundred dollars cheaper at Magic Beans than on Amazon). However, if you have the money (or if someone else is buying) this seat is amazing. It's pretty easy to install without a base, even for the inexperienced. It's rated for babies up to 32 inches tall. The wheels roll surprisingly well and the break is easy to access (also flip flop friendly!). This seat is approved for use in cars both in the U.S. and Europe (which is quite rare), as well as air travel. Plus, it's just a really well made, well thought out seat. Much like the IMMI GO it falls into that non-committal space of "we're going somewhere on foot/transit but may want to take a car back". It's perfect for occasional car users and heavy air-travelers. Note: I would not recommend using this seat exclusively as both your car seat and stroller. This is a car seat on wheels, not a primary use stroller. Remember, car seats restrain kids enough to keep them safe in a car crash, which is to say they pretty much restrict all movement. This is not good for babies if it's done for too many hours a day, every day, for a year. This is a great solution for a family trip to avoid having to bring extra gear. This is a poor solution for daily continuous stroller use. I have not personally used this seat myself, but it looks like a fantastic value for the following reasons. - Rated for babies up to 32 inches tall. - Graco is a brand which all strollers that make any adapters at all, will make an adapter. - It weighs only 7 lbs, for those times you do have to carry it. - Recommended by The Car Seat Lady for easy installation in a taxi. When we were shopping for baby products in preparation for my daughter's arrival 3 years ago, all infant seats topped out at 30 inches. We selected a Chicco Keyfit 30 Infant Car Seat because of all the seats we tried, it was the easiest to install (and we tried a lot of seats). The seat served us well until my daughter was 15 months old, at which point she became too tall for it. We ended up having to purchase a convertible car seat for her until we were ready to turn her around. We got an Evenflo Tribute because it was cheap and light. However, though light, the bulk of the seat made it a pain to transport and its poor construction made it really hard to install rear-facing. It is reasonably ok to install forward facing, but the transport issue remains. (This may help to explain to you some of my enthusiasm for when the IMMI GO came on the market). Much as the Chicco served us, I don't think I would buy it today because of the better options available. Still not convinced and absolutely want to avoid an infant only seat? Sigh... ok... at least get a high quality convertible seat that's light weight (Combi Coccoro). You can even turn it into a makeshift "travel system" with the Mountain Buggy Nano Stroller according to The Car Seat Lady. (The Nano will accept any car seat without an adapter because it attaches them via what is basically a seat belt). That said, only choose this combination if you plan on using a carrier exclusively until the child is ready to go into the Nano directly (probably around 3 months, though the specs say 6 due to overly conservative rules on this). Alternatively you can transport the child in any regular stroller of your choosing and put the Coccoro in a car seat backpack. (We did the backpack with our Evenflo Tribute and "lovingly" referred to it as our "man-sized safe"). This post is in the series of posts about carfree living. Other posts include thoughts on strollers for urban use, necessary accessories, and whatever else we think to blog about!